This project took place in the 2010/2011 school year. 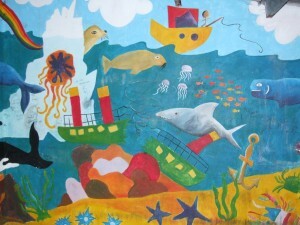 On the 5th of May 2011 an artist called Karen Webster came into 6th Class and talked to the class about the sea. She explained to them that they would be designing and painting a mural for the bicycle shed at the back of the school. She asked the class to draw and paint some ideas that she would scan to design the mural. It was decided to do the mural on the theme of the sea because Karen thought that the sea was very important in our eco-system as well as the fact that our school is so close to the Atlantic Ocean. After discussing the sea and sea life, studying books and admiring other murals, the class got to work. The class drew their creations on water paper and then painted them. There were various stages in the planning and designing of the mural, including sketches, charcoal drawings, water paints and acrylics. Karen displayed all of the children’s work in the room and the children gave their input as to where each piece should go in the mural. The next step was for the children to colour the plan. Each group coloured their own plan and Karen used bits from every plan to decide on the colours for the actual mural. Karen then transferred the outline of the mural onto the walls of the bicycle shed and the children began painting the mural. At first, a grid was drawn onto the shed wall onto which the fish and animals were outlined. Karen and the pupils then started painting it with colour and detail. Karen came to the rescue to help pupils not to make mistakes like running paint or painting over something! The class were split into four groups and each group took turns over half hour periods working on the mural. Overall, it took four days to complete the painting of the mural and all the pupils were thrilled with the finished product which will adorn the rear of the school for many years to come.